Mercersburg, Pennsylvania — Profits, both per-cow and total farm, are way up at Cove Mountain Farm, the American Farmland Trust’s dairy grazing showcase for the Northeast. Per-cow milk production in the seasonally calved herd peaked 11 pounds higher this spring compared to a year earlier, and production was holding at a much higher plane this summer despite a long stretch of hot weather. Cow body condition is much better, and conception rates have improved markedly compared to those of a couple of years ago. The amount of labor required to produce 100 pounds of milk has substantially declined. And Glenn Moyer, who has run Cove Mountain’s dairy on a lease basis since the operation’s beginnings nearly six years ago, is very happy these days. No single factor explains everything on a grass-based dairy. For instance, Glenn says results have been improved by the fact that he has converted a substantial number of acres out of endophyte-infected tall fescue, and into ryegrass. Along with better weather and higher milk prices, this could go a long way toward explaining why Cove Mountain netted $165,099 last year, compared to $59,390 in 1999. (Note: Cove Mountain has access to rent-free acres for hay and heifer grazing, but these items are booked as costs at general market rates.) As of July another good year was in the cards despite low milk prices and dry weather. Still, another factor seems to be involved – one that Glenn has been reluctant to talk about too soon from his very public position as Cove Mountain’s manager. This factor has nothing to do with grazing, although Glenn and others view it as an important pasture management tool for heavily stocked grass dairy farms. Arguments can be made that it is hiking feed costs while increasing the likelihood that pasture management will suffer. But after more than a year of use at Cove Mountain and other places, the evidence appears to be in: The Northeast version of “one-shot” seems to be working. One-shot is a high-fiber grain and commodity byproduct ration that includes many of the benefits of dry hay and corn silage without the labor and equipment involved in handling those feeds. With a $7,000 system that includes nothing more than a feed bin and an in-parlor flex auger/feed bunk system, Cove Mountain cows have been consuming an average of about 30 lbs./day of one-shot during milking – a plateau far beyond what’s considered safe if grain alone is fed in two daily slugs. Instead of spending 35-40 minutes around milking time to feed grain and silage in an outdoor feedlot, Glenn now does pretty much the same thing by turning a switch and allowing the cows to feed themselves while he milks them. And, whether or not one considers this a tremendous compromise to a grass-based system, Glenn says that he simply cannot dispute what one-shot, along with eradicating the fescue and some of the other changes he’s made over the past couple of years, has done for his dairy herd. “We’re actually feeding the cows well again,” he asserts. One-shot, which combines grain-based energy sources with high-fiber commodities such as citrus pulp, cottonseed hulls and soyhulls, is nothing new for southern grass-based dairies with access to cheap citrus and cotton byproducts. In Florida, Norm Nickerson has been feeding a one-shot ration alongside pasture for several years, and says it is one of the most important tools in boosting cow health and stocking rates on his farm (see story, page 9). A few years ago the practice spread to Texas, where Steve Roth and other dairy grazing leaders have used one-shot as a means of feeding moderate levels of grain along with some “scratch factor” to supplement managed pastures. With better grasses and legumes, plus higher citrus and cottonseed costs, most northern graziers have focused on grazing and corn/soy supplements. Glenn was one of them. “The feeling when we moved here was that we would be all grass and grain. We figured that was all we needed,” he says. But with a high percentage of his pastures dominated by endophyte-infected fescue, the cows simply were not performing well. Strangely enough, it was a New Zealander who introduced Glenn to one-shot. Ron Geck, a North Island dairyman who has toured many leading U.S. grazing dairies over the past eight years, had been talking with Glenn since 1999 about Cove Mountain’s troubles in feeding cows and expanding the seasonal calving herd from within. Geck told Glenn to take a trip to Texas. Glenn did so, and returned with a one-shot ration that he could show to local feed suppliers. He checked price and availability with half a dozen companies before settling on a formulation. Cove Mountain started feeding the ration on the concrete pad adjoining the swing parlor in February 2001. As is shown by the rations published in this issue, the Pennsylvania versions of one-shot are substantively different from what Nickerson feeds in Florida. Arguments can be made that the northern version lacks some of the rumen-function enhancing “scratch factor” provided by Nickerson’s one-shot ingredients. Do the economics make sense? Having no experience with the feed, Glenn did not contract a price during 2001, and ended up paying between $140 and $170/ton. For this year he contracted at a base of $144/ton from a different supplier, with the price varying slightly as Glenn tweaks the ration. It works out to about 8 cents per pound of dry matter. If a cow is eating 30 lbs./day as fed (about 8 lbs. of corn), the daily cost of this one-shot ration amounts to $2.25. At 60 pounds of daily milk, which is where the mixed-breed herd was at last spring, the per-cwt. cost amounts to $3.75/cwt. For his money, he appears to have bought quite a bit of milk. Spring 2002 milk production peaked at 64 pounds/day, up from a 53-pound peak last year. In 2001, cows were milking about 30 lbs. at dry-off, compared to less than 20 pounds at season’s end most previous years. This year, with cows eating an average of 6-8 lbs. of additional one-shot per day, the herd was holding at 53 lbs./day in mid-July. Cows, which are wintered outdoors, now weigh 50-100 lbs. more than they did prior to starting with the one-shot. 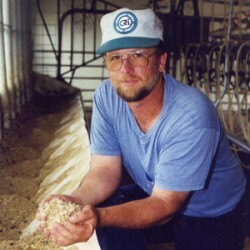 Corn silage had improved matters by spring 2001, but Glenn says body condition did not really become adequate until he’d fed one-shot for a few months last year. With improved pastures and about 23 pounds/cow of one-shot fed in outside bunks, “cows put condition on all year long,” Glenn says. Breeding performance has improved markedly. This spring, 85% of the herd calved during a 10-week period, compared to just over 70% in 2001. Repeat heats appeared to be minimal this summer. The same things can be accomplished by supplementing pasture with corn silage and TMR rations. Yet such feeding creates logistical and labor problems for a farm that was aiming to manage more than 200 cows with slightly less than two labor units (Glenn’s children, Matt and Greta, are also involved) and minimal feed handling investment. Last year, Glenn was feeding one-shot to 170 milking cows in bunks on a feed pad designed to handle 130 head. “We were spending 35 to 40 minutes feeding cows and waiting for cows to eat before they were milked,” he describes. With a big heifer crop and a low culling rate, Glenn knew coming into 2002 that he would be milking close to 200 cows. It was either split the herd into two groups, or do something that Glenn had said he would never consider: feed grain in the farm’s 18-unit swing parlor. He chose the latter, and ended up spending $7,000 for the auger system, feed bunks and a bin that can hold five days worth of one-shot at 30 lbs./cow/day. This summer two people were milking 225 cows in about an hour and 45 minutes. “Feeding in the parlor has not slowed us down,” Glenn reports. He says the parlor was turning out more than 3,000 lbs. of milk per hour early this summer, up 50% from last year. And this year he is cutting out all the additional time required to supplement pasture in the outdoor bunks. “The extra money I’m spending (on one-shot) gets credited as a feed cost, but what about the labor I’m saving? I’m buying an awful lot of labor in this feed bin,” Glenn says. The system also opened the doors to opportunities. For instance, last March a former Cove Mountain intern asked Glenn if he would be willing to milk his 38 cows this year. With the feeding system in place, the cows could be accommodated (on the books as leased cows) with no extra expense, and no additional labor beyond a couple of extra milking shifts. “This system allowed us to make that decision,” Glenn says. There are some downsides. Glenn says there’s more commotion when cows enter the parlor, and they need to be chased out more often. Water consumption is way up, which is a problem on a farm with limited well capacity. Last spring, the cows were probably eating a little too much one-shot with the free-choice offering. “They just love the stuff. They didn’t back off on one-shot, even during the pasture flush,” he relates. That could spell some trouble when the herd is in late lactation this fall. Glenn says that, assuming a summer drought does not linger into fall, he may install a metering system that will allow him to limit-feed the one-shot, and avoid fat cows. And there is always potential for problems in managing pastures with herds receiving high levels of supplementation. Cove Mountain harvested about as much baleage this year while feeding 225 cows as it did in 2001 feeding only 170. Paddocks are being made smaller in order to attain adequate grazing pressure. And there are exciting possibilities for employing one-shot as an extremely flexible pasture extender. This year, Glenn adjusted the ration from 16% protein with dry hay prior to the pasture season, to 14% when the herd was moved to grass, to 12% for a couple of weeks at the height of the flush, and back to 14% by mid-May. In the future, he may fine-tune the amount of one-shot provided based on pasture conditions on any given day. “Part of this is that I’m reacting to the fescue. If I had more good quality grass, maybe I wouldn’t need the one-shot,” Glenn says.